Argentina and Barcelona star Lionel Messi insisted he was "just another player" despite being considered among the all-time greats. Messi, 30, is a record five-time Ballon d'Or winner, having enjoyed an incredible career at the LaLiga giants. "I don't consider myself the best, I think I am just another player," Messi told Paper Magazine, in which he posed with a goat for a photoshoot. "On the field, we are all the same when the game begins." 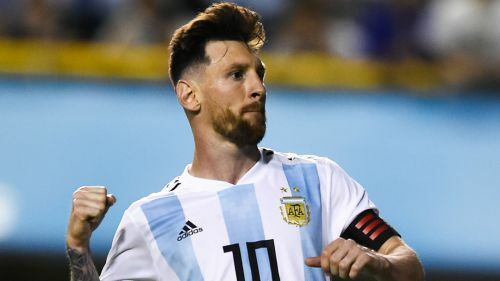 Jorge Sampaoli's men will face Iceland, Croatia and Nigeria in Group D in Russia and while Messi admitted Argentina – runners-up in 2014 – were below the level of the favourites, he hopes they can deliver at the showpiece tournament. "It will be important to prepare well, because in the qualifiers we were fighting up to the end and we didn't have time to prepare ourselves," he said. "We still have to make ourselves stronger as a team to be in the running to win and be at the same level as other teams like France, Germany, Brazil or Spain. "But we have a good group of players and the Argentine team is always going to be a candidate to win, it doesn't matter how we get there. "We always aim to win and we will try to go slowly but strongly to advance in the competition."